The Agogwe is a rust-colored, downy-haired, 1 to 1.7 meters (2-5 feet) tall unknown biped reported throughout east Africa. Said to have yellowish, reddish skin underneath hair, the Agogwe allegedly inhabits the forest of this remote region. “Some years ago I was sent on an official lion hunt in this area. While waiting in a forest glade for a man eater, I saw two small, brown, furry creatures come from the dense forest on one side of the glade and then disappear into the thicket on the other side. They where like little men, about 4 feet high, walking upright, but clad in russet hair. The native hunter with me gazed in mingled fear and amazement." That's interesting. I don't think I've ever heard of Agogwes before. I wonder if those little critters could be related to some of the early hominids that evolved in Africa. It's description is very similar to some of them. Or could it possibly be an uncataloged species of bipedal ape? 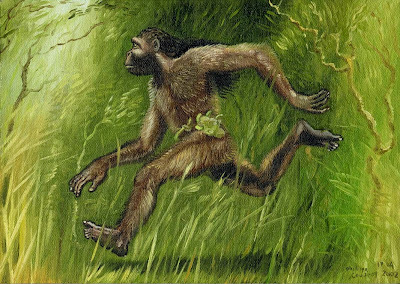 Every now and then an ape will be born that does walk upright on his rear legs. I've seen several chimpanzees and orangutans do it but it's not really a natural position for them to be in. I wouldn't describe them as being graceful either.